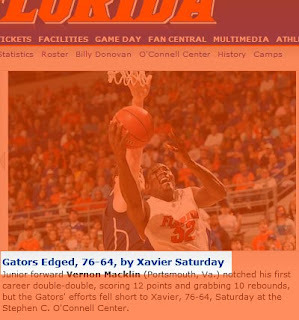 Florida "edged" by Xavier last weekend? Just how does one define a 12-point loss to an Atlantic 10 team as being edged? It happens when that is how the losing school writes it up for their web site. It happens when schools try to control the message through their web sites. It is a perfect example of why moves by schools and conferences to create and control the message on their own should not happen. Being edged is when you lose by two or three points in a back and forth game. It is not losing after being down by 16 in the first half, or having missed 11 of your foul shots. In the article itself, the Florida media machine wrote, "The teams swapped the lead four times before Xavier (17-7) went ahead 54-52 with 9:20 to play on a Ken Frease jumper. From there, Xavier’s Jordan Crawford hit a three-pointer to start a scoring spree." That is not being edged. That is being outplayed and out-hustled by a team that theoretically, if you listen to all of the hype around Southeastern Conference (SEC) basketball, should not have even been on the same court as the Gators. If schools want to control the message and still be credible, the stories they publish have to show some level of credibility, not what they want people to read.